Why it’ll be profitable for You to place information about Your services on our web-site www.bestofukraine.com? • One of the most popular travel sites on the web among the English speaking audience, which allows you to get the attention of those specifically targeted internet users. 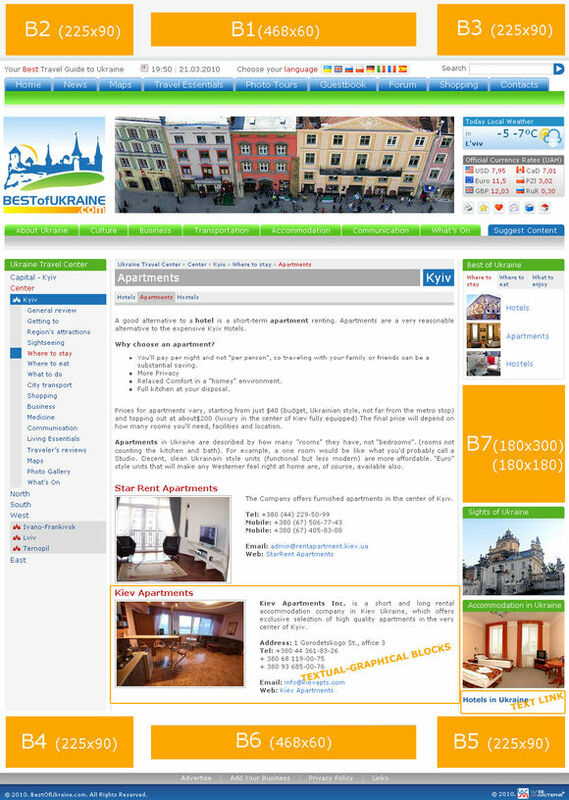 The name www.bestofukraine.com was online since June 2005. • Everything the person might need while getting ready to visit Ukraine for business or leisure. • Visitors come to our web-site from different search engines, catalogues and ratings of Internet recourses, from active links and banners of other web-sites or using their own bookmarks. • The web-site is getting advertised in the Google AdWords system in such English speaking countries as Canada, USA, Great Britain and the Netherlands. The advertisements AdWords are shown through the Google Network: search and content sites, and on other products and blogs. The Google Network is the largest advertising network available online, reaching over 86% of Internet users worldwide. • We can send targeted visitors directly to what you are offering! Interested in FREE placement? Go for it! 2. BANNERS of different sizes: 468x60 pixels, 180х150, 180х300 and 225x90. They could be placed on one page or throughout the web-site. Please note, all advertisements should be in English. • Payment is made in Hryvnia according to the NBU rate on the day of payment for companies in Ukraine. Payment could be made in USD via PayPal for companies outside of Ukraine. • Administration of the web-site BestOfUkraine.com has all rights to refuse in advertisement placement if to our opinion advertising materials are not relevant to the interests of our audience/users or could be considered potentially abusive, vulgar, obscene, hateful or harmful for any audience. BestOfUkraine.com invites You for our mutually profitable collaboration!